I am always looking for ways to mix up the typical work attire. Some days I wish I worked from home and could wear whatever I want. Not so I could wear sweats all day, but just so I could wear anything from my closet without wondering “is this professional looking” “is this long enough?” “will my feet and knees kill going up and down the stairs all day?” I want to be professional and practical yet fun at the same time. 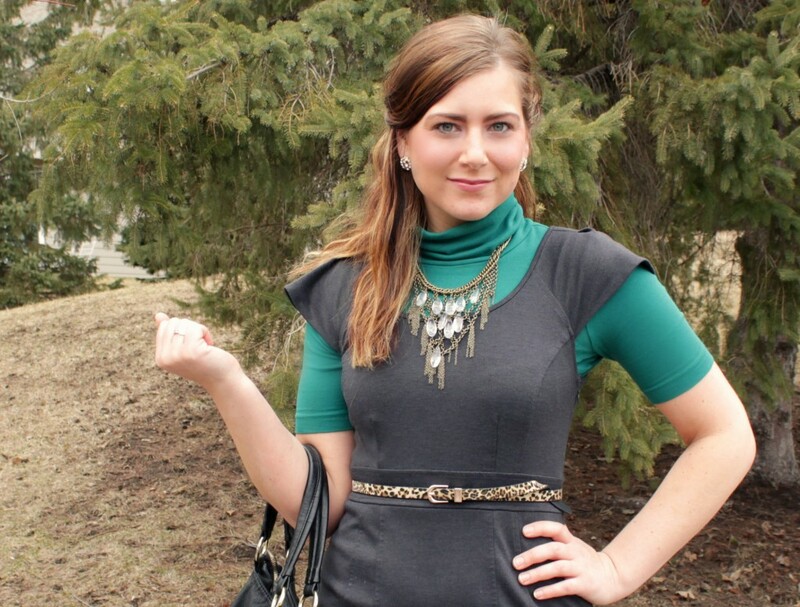 I know some people don’t like the look of layering under a dress, but I really liked the idea of this teal turtleneck from Target under a gray sheath dress to add something bright to this otherwise neutral outfit. I love neutrals, but I am always drawn to outfit inspiration that incorporates color. Anyway, with the teal and a leopard belt I felt pretty good about mixing it up at the office. Also, I have really wanted to show up in sweatpants or jeans every day this week because the boss is out. And I really loving my new jeans, so it would have been a great week to do that. Then I remembered that HR, the CEO and other important people at work would still see me. Drats. I can never pull up that dress and tee look, but you did it so well. And you look so pretty. I love that gray dress! But its fun to add a layer underneath to mix it up (and also essential when the weather is so wacky!) I have a business meeting today and I’m actually wearing a black sheath dress with a dress shirt under it. I love this layered look! I feel your pain on wanting to wear sweats to work–if only we could be self employed! I love this! I have never before seen anyone over the age of 3 make a turtle neck look cute but you did! I love everything about it. Awww you are too sweet! Yeah turtlenecks can definitely be childish, but I kind of love them. I own two and try my best to make them look chic! The top looks really cute layered with the dress…it adds some nice color to the look! Don’t hate me, but I wear jeans to work…my office is very casual. Love how you layered this look! Such a creative way to re-imagine two totally different pieces! So pretty! Any time you can add a pop of leopard is a good day in my book! Loving the dress, doll! Highlights your tiny waist. And I’m always trying to switch up my office attire, too. For example, yesterday it was skinny dress trousers, pumps, and a fitted button-up. Very NYC 9-5. And today I’m in a white maxi skirt, desert booties, and a chambray shirt. HA! i LOVEEE the almost abstract feel of that dress and with the pop of green underneath it’s just beautiful!! perfect look for the office. 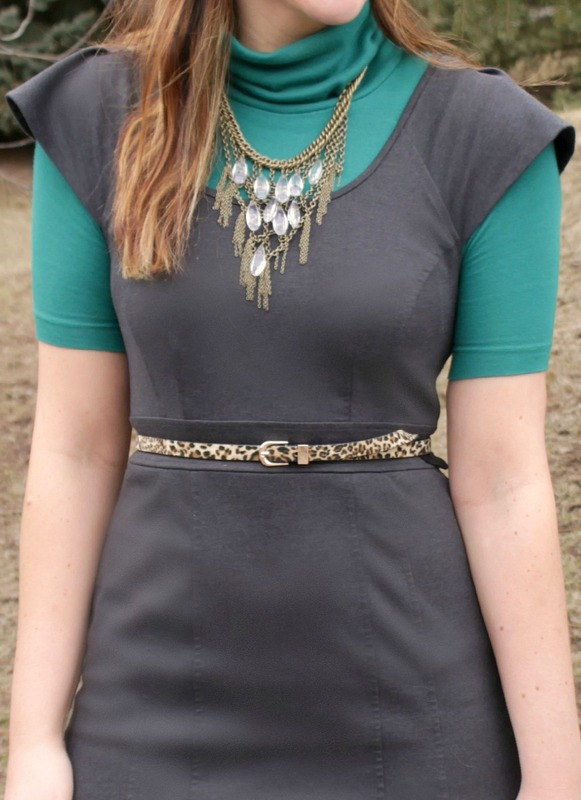 chic and classy but still fun with the leopard belt and statement necklace! This is a great professional look! I love the shirt under the dress and your fun leopard belt! I sometimes push buttons a little bit for office attire, but I try to keep it mostly professional! you look gorgeous. i love the layering! Thanks Ginny! I just kind of put it together the night before and I was like… this may or may not look silly once I actually have it on. But I liked it, so I’m glad others are liking it too! You look gorgeous – I love the green & leopard together! Cute look! Love the peek of green! Thank you Emmy! I appreciate it 🙂 And it is getting nicer in Minnesota, but not that nice haha! I was kind of questioning the look at first, but this really works well and looks gorgeous. I suppose that’s what I’ll be missing once I graduate – dressing without really worrying about if it’s professional. LOL showing up in your pj’s would not go so well with your CEO, no! But that would be awesome. Anyway, this is a great work attire. It’s not boring and bland like more corporate way. Glad to see you inject some fun into the outfit, and you look great! I love the layering! You look work appropriate but totally stylish – that necklace is just divine! This is super cute Rach! I totally get your feelings about looking professional but on the other side – as someone who works from home – sometimes you just want to lose the sweats or jeans and wear something professional! Absolutely love this dress and how you layered the shirt underneath. You look so classy and beautiful! Looking fab as always and I love the dress! Have a great weekend! I love this look! I love how your eyes match that green (even though they are usually blue!) – you really look just gorgeous.. yay for warmer weather – here we come Kona patio!!! Le gorge Rachel.. Love the layering. I would have never thought to wear it that way.. I love the colors in this outfit! Very chic!